I now know the sound of nearly every kind of car, bus and truck in Cambodia having walked over 100km alongside one of the busiest roads in Cambodia. I know that any bus which comes within 4 feet of me is going to blow my hat off! I know when a car is passing from behind me how quickly I need to jump into the bushes. I know how to get my son’s attention when I need too. . .
oh, that reminds me. . . a little funny intermission. . . walking 100km is a long way. We completed about 25 km each day so far of our Freedom Walk. We are following one road all the way to Phnom Penh. There are no turns, though there are bends in the road. Today, Paul was just trudging along about 10 feet ahead of me when he just followed a tire track in the dirt that went off into the bushes. . . he just kept following it. I shouted at him, but he didn’t look up. He just kept walking. After about 50 feet into the bushes, he looked up and looked at me standing next to the main road and just laughed. He was so focused on the next step, he forgot to look where it was going! Anyway, I can tell you exactly what are the “problem” cars in Cambodia. Lexus 570 and Range Rovers. These young drivers are determined to kill people. You can hear the high whine of the engines as they race down the road at speeds up to 180kph. They will kill anyone in their path and could care less. These are the cars of the elite of Cambodia. People drive by us all day long. It is a road that I have driven for years, but I never stopped and met people along the way. I have met some amazing people and some people in deep difficulties. I met a man with no legs at all, waddling around on his torso. He lost his legs because of a landmine. He was gardening when I saw him! I can’t imagine how hard his life is. Today I met a lady who was completely broken. I snapped this picture right before God tugged at my heart. My eyes saw the boy sitting on the ground and I knew something was not right. I jumped off the road and into the field. The boy was sitting in a fire ants nest. But why where they there in this desolate field? I cleaned the fire ants off the boy who I quickly learned had a mental disability and could not talk nor function normally. There were no houses in some distance, but I saw a small grass shelter on the other side of the road. It was now 5pm and I knew what they were doing. 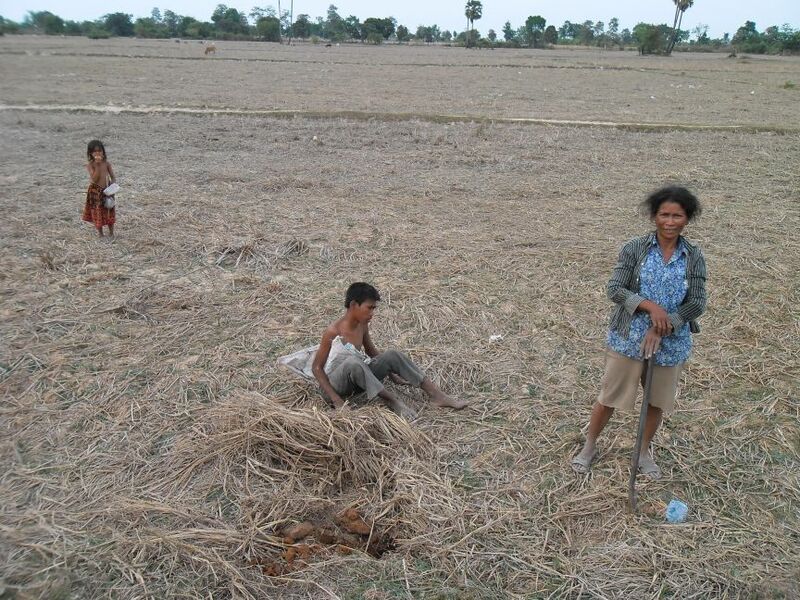 There were digging for any insects or paddy crabs that they could find for their dinner. This was their only food for the day. This was a broken family. These two kids and the mother were the family. I sat for the next few minutes in that field with them and first explained to them about Jesus. They had never heard of Jesus in their lives. I explained to them that Jesus loves everyone and that he can heal people because he is the greatest of all gods! I asked if I could pray for their son and explained what that meant. Paul moved in behind and put his hand on the young disabled boy. I knew that was a big step for him. The boy was filthy, but could not communicate either. He just looked into my eyes as I told him, “Jesus loves you” over and over again. As I prayed I hoped for an instant miracle, but knew that my jumping off that road today was a miracle for them already. How many American missionaries who love poor people do you find walking around rural roads in Cambodia at the very moment they were beside the road? As we got up to go I reached into my secret stash of money and pulled out some bills and gave to her. Instantly she broke into tears right there in that dead rice paddy. She wiped her eyes as she clasped the money. Paul later asked me, “Dad, how much did you give her?” I told him that honestly I didn’t know because I just reached in and gave her some bills without looking. I assured Paul that is didn’t matter how much it was, because God knew what she needed and that I know that there was enough there for her to eat well. I explained to Paul that I don’t have any of my own money anyway, it is all Gods. I am only a steward. Cars kept whizzing by. No one had any idea that God was at work right in the middle of that rice field. Heidi Baker is one of my hero’s as a missionary. She has said many times that us believers need to “Go low, and go slow.” By going low, we need to be more humble. By going slow, we need to really slow down and take time to love people. Walking through western Cambodia for 100km God has reinforced this to me each day, “Go low, go slow.” This is how we are successful in loving others. It seems to me that by going low and going slow you will be encountering people who are hurting and in need. I pray God will continue to give you words and a humble spirit to share His love as you and Paul contine your walk. Continue walking in God’s grace and peace! Thanks so much Friend. It is God who sustains me. A message we all need to hear and obey, no matter where we are…. Loving you from the distance! What a great example you have set of having peripheral compassion. We all should slow down and turn to look toward the right and the left instead of just looking ahead. Only then will we see the people who are so easily overlooked. Thanks for seeing Jesus in the distressing disguise of this woman and for caring for her and her kids. You did for her what Jesus would have done. I like that phrase “go low and go slow”. Thank you for demonstrating to us how that can be lived out in every day life. Powerful words, Steve. Thanks for sharing them and your other postings of your walk. What a blessing! And, only the Lord knows how He’ll use your having faithfully answered His Call to do this. Love you, Brother. Go bless you. I sooo look forward to your posts and appreciate how you are in a way taking us on this journey with you. Very eye opening. Today especially impacted me as I have a developmentally delayed child as well. I will pray for that precious family…..I look forward to meeting up with you and your son on your next post.